Bahati is one of many who are under assessment. We have received some information from the school for about 10 kids, including Bahati, but not yet enough information to determine if these are kids we can sponsor, and if yes, how much sponsorship they will need. 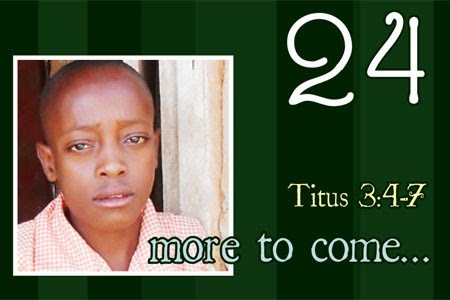 After writing this Advent guide, we added Martin and Michael Marifa and Benta These 3 have all been sponsored. Additionally, we have 2 MKKs in high school who still need sponsors (Mercyline and Chrispus). For paperwork to be completed for our high schoolers in a timely manner, for wise decisions to be made regarding Chrispus, that the Marifas would be encouraged by their sponsorship, and for Mrs. Marifa's health.